A bizarre customer meltdown captured on cellphone video shows a woman throwing bottles of beverages from fridges and sweeping items off shelves onto the floor before casually walking up to the cashier to try to pay for a bottle of Vitamin Water and a can of Pringles. It's not clear what sparked the meltdown inside the QuickChek convenience store at the Harrison Plaza Shopping Center on Bergen Street Friday morning. Employees tried to confront the woman as she marched through the aisle and swept her arm down the shelves, sending merchandise cascading onto the floor, video shows. She calmly strolled up to the cashier and, apparently waiting in line to pay for a bottle of Vitamin Water and Pringles she was holding, grabbed what appeared to be packets of gum or candy from a display and flung them back over her shoulders. After she got up to the counter and took out her card to pay, she apparently changed her mind and ditched the items, walking out of the store and into the parking lot. She got a black sedan and peeled out of the lot, nearly crashing head-on into an oncoming car as she made a left turn. 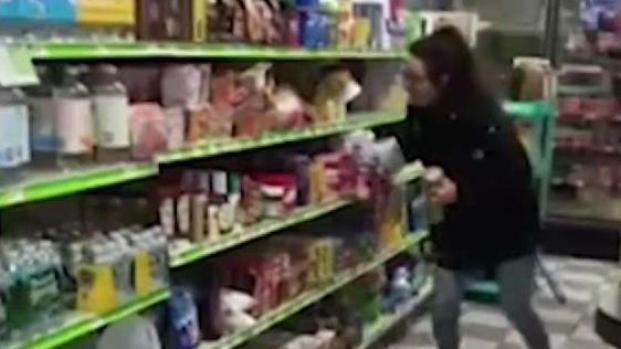 A woman trashes a convenience store in a bizarre rampage in New Jersey. Police are looking for her after the tantrum in Harrison. Michael George reports. Police in Harrison are searching for the woman in the tantrum.